Five cousins are looking forward to their annual vacation at their grandmother’s cottage. None of them knows that this may be their last such summer. A mining company has set its sights on the land and is determined to seize it. 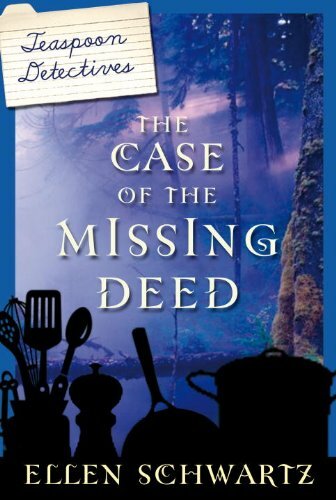 Grandma must produce the deed to prove that the property is really hers, but her memory is not what it used to be, and she can’t find it. 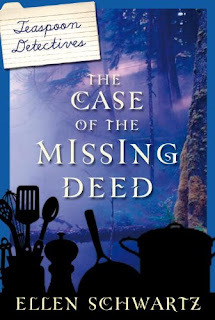 The children suspect there may be clues to the deed’s whereabouts somewhere in the family’s cherished trove of recipes. But can they solve the mystery in time? Food and mystery lovers are invited to join author Ellen Schwartz for the launch of her book in Vancouver, BC. Barbara-Jo's Books to Cooks in Kitsilano is hosting an event on Oct. 13 at 6 PM, where guests are invited to listen to readings from the new mystery while sampling goodies featured in the book. They'll be prepared by pastry chef Merri Schwartz, founder of Growing Chefs in Vancouver, and also the daughter of the author. The event is free, call 604.688.6755 to RSVP. Author Ellen Schwartz, born in Washington, DC, has published dozens of magazine articles and adult short stories. Her children's stories have been published in magazines and teaching anthologies. In addition to teaching creative writing at Simon Fraser University and Douglas College, she works as a corporate writer and runs a communications consulting company with her husband. Prior to her writing career, Schwartz was a special education and primary school teacher, along with an environmental educator.